It is with great regret and pleasure that I give you my lowest scoring whisky so far. 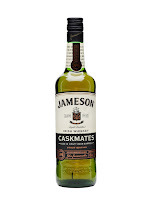 It’s Jameson Caskmates, as if the normal stuff wasn’t good enough, they finished it in Stout casks from a local brewery. Unfortunately, I’m not a big fan of beer and Stout is way into territory I don’t care to tread. Nose: Cut grass, jam and marmalade, floral and herbal, flowers and pollen, vanilla, bit of fudge. Taste: Light and thin. Vanilla, sweet light fruit, tangy into the finish. A thin whisky that doesn’t do much for me. Nose: An earthy dark beer, marmalade, jam, lime, toast, butter. 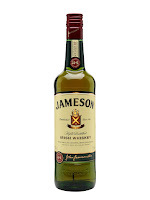 With time- Nail polish, more floral Irish notes- Grass, sweet oak, more Stout and steak. An awful combination. Taste: Very creamy arrival, then nothing for a second, then developing dark beer, toast, marmalade, some oak, some salt and grass. Weird flavours, thin again. Partially matured in Ex-Stout casks. I hate beer, esp. Stout. Probably explains why I really don’t like this. I’m sure there are worse whiskies out there, but for the moment this is my lowest score I’ve given a whisky.